With a distinct possibility that the wreckage spotted today in the Indian Ocean by five different aircraft will be from flight MH30 British Airways has been forced to abandon an appallingly timed advertising campaign. 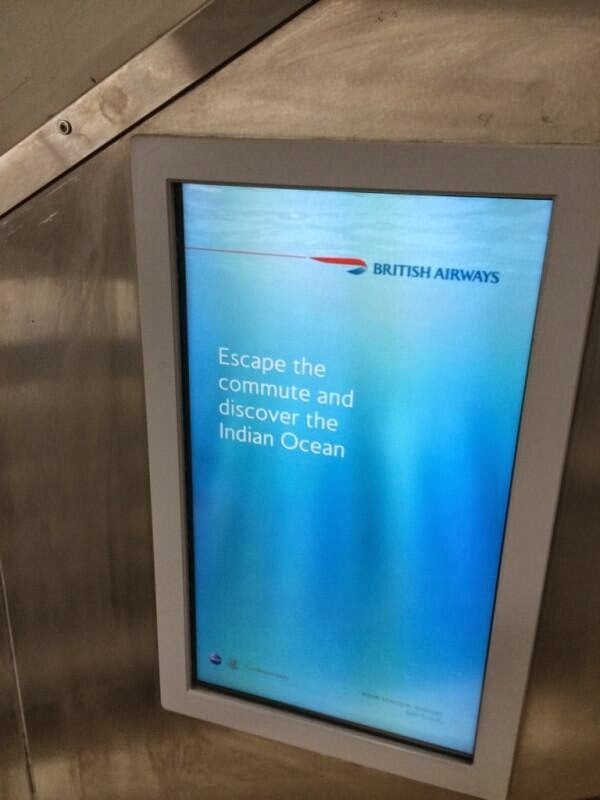 Screens in railway stations in the London, notable Euston, carried the advert ‘Escape the commute and discover the Indian Ocean’. It seems nobody thought it was in bad taste until it went public. “We are very sorry for any offense caused. The advertising campaign featured in the UK is being withdrawn. This campaign was planned some months ago and we recognise that its appearance at this time is inappropriate,” a British Airways spokeswoman said. Meanwhile in the southern Indian Ocean in a search area 680 miles north east of the previous location, multi coloured objects have been spotted in the water – more than 400 of them. Various news sources are already reporting these objects as definitely coming from MH370. Hopefully ships will be able to check tomorrow.